There are quite a lot of schools, usually through their Parents/Teachers Associations, organising Charity Walks to help swell the school funds and provide those little extras that can often have a dramatic impact on the resources and the quality of education provided. One such school is Totley Primary, situated to the south of Sheffield, right on the doorstep of some of the most beautiful country within the Peak District, and the organiser of the Derbyshire Monuments Challenge Walk. On this walk I was with Ray and a couple of his walking friends, Tommy and Bob. All three had done the walk the year before and had encouraged me to have a go this year. As usual it had been an early start from our homes, all of us travelling in Ray’s "Mini". Having gone through the necessary signing in etc at 8.30 on a very pleasant morning we were ready for the "off" and the trek to the first checkpoint in the Car Park of the Fox House Inn which is high on the moors on the road between Sheffield and Hathersage. All walks have their difficult/hard bits. This one was at the beginning when we went, more or less, straight up hill and across the moors to the Fox House Inn. Although it was early in the morning and the sun was not causing any problems I was not alone in being pleased to reach the first check point. Here the opportunity was taken to make good use of the drinks that had been provided. It really had been a good pull from Totley but it was nice to think that it was the hardest climb of the day and it was behind us. I calculate the distance was 3.4 miles which we did in just under an hour, which, when I look back and think of the uphill "pull", was "pretty good going". From here we went into the grounds of the Longshaw Estate and we had the choice of getting to the next check point at Curbar Gap by either White Edge or via Froggatt and Curbar Edges. We selected the latter and enjoyed the easy stroll through the grounds of Longshaw before walking down the road past the Grouse Inn to get to the footpath that we would follow over Froggatt and Curbar to Check Point 2. The beginning of Froggatt is quite easy walking, but as it continues it does get more rugged. However, the views to the west are superb. Looking just to the northeast is Eyam Moor and below in the valley the River Derwent passes by Grindleford, Froggatt, Calver, Curbar and Baslow before going through the Chatsworth Estate which was on our route today. But that was in the future and before we got there we had to walk the length of Froggatt, Curbar and Baslow Edges before dropping down to Baslow itself. By the time we got to Curbar Gap I estimate we had covered 8 miles and it had taken 2 hours 16 minutes. Yes, we really had been moving, but I anticipated the pace would decrease as the day wore on. After Curbar Gap, rather than going directly along the track that goes past Eagle Rock and close to the Wellington Monument, the first of the two monuments, we took the path right on the edge of the ridge. It was a little bit longer but we kept the westward views over the Derwent and came in close proximity to the beautiful Highland Cattle that are a feature of Baslow Edge. From here it was downhill to Baslow walking past the Village Hall, the starting point of the Chatsworth Challenge Walk. In fact the route from the beginning of Curbar Edge to Baslow was the first part of the "Chatsworth" in reverse and the route that would take us from Baslow to Beeley was the last part of the "Chatsworth" in reverse. This part of the walk was therefore well known to us. While walking this Baslow to Beeley 'leg' there were a few spots of rain and I was beginning to expect the worst but they soon vanished and we continued merrily across the parkland to Beeley. I must however mention the wonderful views of Chatsworth House and its estate, which we enjoyed as we looked across the River Derwent. Magnificent. Beeley was 14 miles from the start. We had got there in 3 hours 50 minutes, which meant that we should complete the full 26 miles in less than 8 hours. However, we agreed that we had earned a 10 minute lunch break and devoured our sandwiches in the car park to the Devonshire Arms, where this check point was located. Needless to say we were very tempted to quench our thirst with a pint of alcoholic beverage but as marathon walks and beer don’t mix we resisted the temptation and kept to the orange squash and water that had been provided by the walk organisers. We were not sure of the best way to reach the next check point at "Robin Hood", the public house on the Baslow/Chesterfield Road. The previous year Ray, Bob and Tommy had followed a track that went on to Beeley Moor and from there to Robin Hood, via Gibbet Moor. However, they had not been thrilled with this route, as much of it was over open moorland, so when we spied a group of lads that were on the walk, who looked as if they knew the way, we decided to follow them. They were taking a concessionary path that went to the farm at Beeley Hilltop and on through the Chatsworth Estate, close to the Hunting Tower and then along Dobb Edge to Robin Hood. My three companions all agreed that it was a much better route than they had used the previous year and in less than 2 hours we had covered the 4 miles or so. Yes, as expected we had slowed down but we had thoroughly enjoyed this stretch of the walk. Tommy had even taken the opportunity to take photos of the Hunting Tower, situated on the hillside high above Chatsworth House. Also as this part of the walk had been new to us, and as "our guides" had walked a little bit quicker than the four of us, we had lost them and our own navigation skills were required. It was therefore inevitable that ensuring we remained on the correct route also slowed us down. However, I understood it had been a lot quicker than the previous year and we were all in good spirits when we reached Robin Hood a few minutes before 2 o’clock. Here, at Robin Hood, we had to decide which way to get to the next, and last check point at Barbrook Bridge, which is located on the road between Owler Bar and the north end of White Edge. We decided to go via Gardom Edge and straight up the A621 for nearly two miles until we came to the track that would take us via Barbrook Reservoir to Barbrook Bridge. This was not the best way to go. On reflection we would not have lost so much height if we had gone via Birchen Edge and we would have seen the Nelson Monument as well. It would have also been less noisy and we would have reduced the road walking by about 40%. After this road work it was therefore a great relief to leave the cars and lorries and take the quiet footpath that went left off the road and continued close to the eastern flank of Big Moor and the Barbrook Reservoir to Barbrook Bridge. We however, had really blasted this part of the walk and I reckon we must have been doing in the region of 4 miles an hour. Having presented ourselves at the Barbrook Bridge Check Point, we crossed the road a few yards to the south east and traversed the moorland to descend into Totley and journey’s end. Our time was 7 hours 55 minutes. 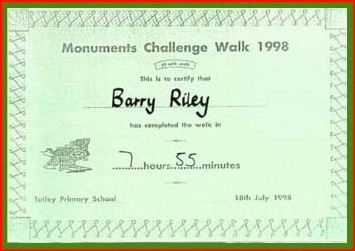 I was very pleased to have beaten the 8 hours and although I was not able to do the walk the following year Ray did and with the knowledge gleaned from this walk, was able to complete it in 7 hours, give or take the odd minutes. I enjoyed the supper we had at Totley Primary. It was a help yourself ploughman’s with lots of tea followed by cakes. The only downside was the school is a Primary school and little people have little legs and little legs means little chairs. It was difficult enough lowering my body down and getting my legs under the dining table but this is nothing to the stiffness experienced 20 minute or so later, when you have get up again. It was a similar situation when I got out of Ray’s Mini when I got home. The hot shower that followed was heaven.